You may have an account that was “owned” by a student but needs to be transferred to a faculty member or another student when they leave. Here is the process for making sure that the new user has access. Make sure the user you’ll be assigning the account to has logged into your DoOO environment at least once (they don’t need to signup but just log in). If the user already has an account you’ll need to set them up to have access to 2 hosting accounts using the Reseller functionality in WHM. 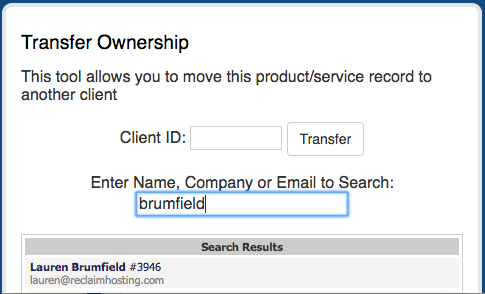 In WHMCS search for the hosting account you’ll be associating with a new user. Go to the Product/Services tab and click Move Product/Service. 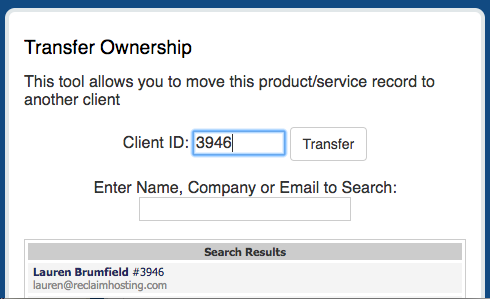 A popup will appear where you can search by the WHMCS profile ID or name for the person you want to move the account to. Clicking the name will populate that user’s ID into the form and then click Transfer to move it over.